The LEGO Movie Emmet Fun Pack – LEGO Dimensions is on sale for $11.24 at Amazon right now. That's 25% off the list price of $14.99! Help save the multiverse with perfectly average Emmet from The LEGO Movie! Join Emmet in a mash-up multiverse of your favorite characters. Build and place him on the LEGO Toy Pad and see him spring to life in the game, then activate his special Drill, Fix-It, and Master Build abilities to solve puzzles! If Emmet runs out of ideas, bring in Emmet's Excavator and rebuild it into The Destroy dozer and Destruct-o-Mech for upgraded in-game powers! 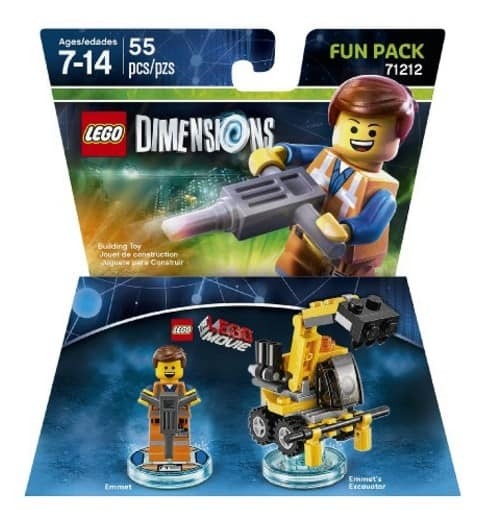 Check out all of the LEGO Dimension Fun Packs on sale!